Three faculty from George Mason University responded to questions that ask how an instructor’s professional development affects the experiences of students and faculty in online writing instruction (OWI) courses. Ariel Goldenthal, Jessica Matthews, and Jennifer Messier revealed that a major instigating factor in their research was the decommissioning of a building on their campus. George Mason University is the largest public university in Virginia, with recent enrollments in the upper 30 thousands. In any given semester, GMU offers more than 200 sections of first-year composition and advanced composition courses. The decommissioned building, the presenters explained, was the site of a majority of those courses throughout each day of the week. With a new building years away from completion, and with George Mason University seeking to offer fully online degree programs requiring all courses to be available online, writing faculty found themselves needing to prepare rather quickly to teach online. The presenters explained that it was the best of times because everything they wanted to happen did indeed happen: A small cohort of faculty were trained to develop online and hybrid FYC courses and an online version of a writing-intensive literature course. They added that it was the worst of times because everything that they didn’t want to happen also happened: The amount of professional development given to each faculty for creating the courses varied greatly. Some instructors had more than five years of OWI experience, while others had none. Some were given a year to build an online course with an instructional designer, course release, and/or stipend. Others had to build a course in one or two months without the guidance of an instructional designer or the compensation of a course release or extra pay. The presenters then discussed their own experiences in developing the online and hybrid courses. 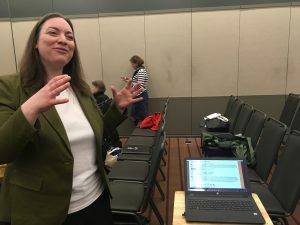 Two presenters—Ariel Goldenthal and Jennifer Messier—represented faculty who developed their courses without many, or even any, of the support outlined above, while Jessica Matthews represented faculty who were supported in most of it. 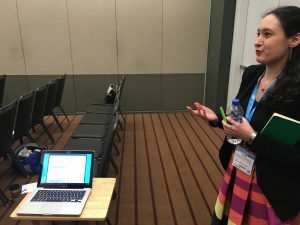 In discussing her development of online writing courses, Messier compared the process to adding layers to a human body. The first course design was a “bare bones” design, just the skeleton of the course created, with the course featuring readings, a discussion board, and process work. The next year, she added musculature to the course by creating instructional pages with detailed content, and announcements with goals and deadlines for each week. With each successive build, her course became more sophisticated and effective. Goldenthal discussed creating a hybrid writing course. She made the observation that there exists much less scholarship on hybrid course development than on purely online course development. This resulted in a process of course development that started out by entirely mirroring face-to-face courses in the first term and then making changes to better suit the hybrid mode of class delivery. In the first term, Goldenthal taught the hybrid course based on a thrice-a-week schedule, with one day of in-person instruction and the content and activities of the other two days moved online. 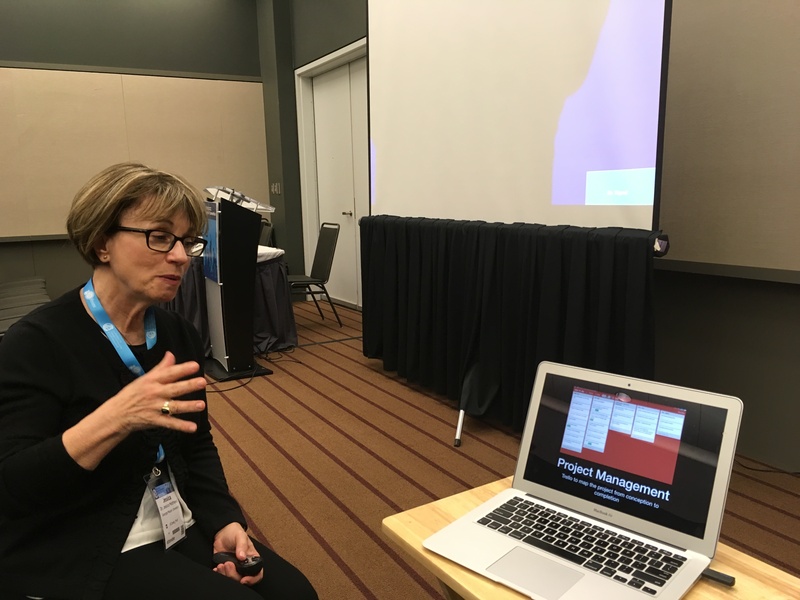 In the next term, she recognized the need to divide deliverables from active-learning work, placing the former online and including the latter in face-to-face class sessions. 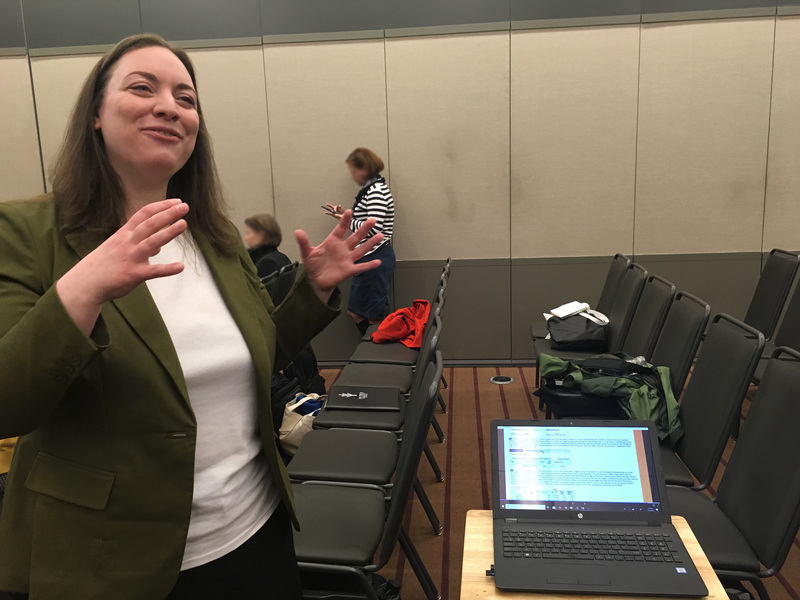 After sharing their experiences, the presenters responded enthusiastically—and, dare I say, awesomely—to the call for presenters to perform at CCCC 2019 by creating space in their presentation for the audience to interact with the presenters in the midst of the presentation. Goldenthal, Matthews, and Messier adapted their original intention of building a “gallery walk” to the space and chair arrangement of the room by placing their laptops at various spots in the room. Then, attendees were invited to visit each of the presenters’ stations for a guided tour of their course development processes and shells via PowerPoint and Prezi presentations. Much like a digital poster gallery, this interactive portion of the presentation allowed attendees to learn more about each of the presenters’ situations and to ask questions up close. Jennifer Messier explains her course development process. 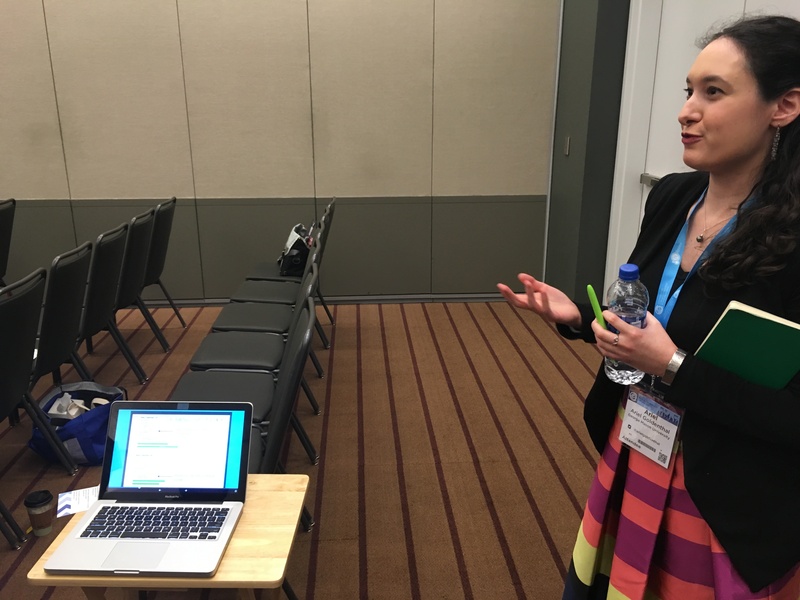 Ariel Goldenthal discusses the insights she gained in developing hybrid courses. Jessica Matthews talks about the course she designed with more professional development experience. After this enriching and engaging gallery walk, the presenters reconvened to offer concluding remarks. As one could guess, the process of building a course with more time, guidance, and compensation resulted in better courses. The faculty who had instructional designer support in building their courses, because of the strong initial course development, had little in need of changing in the following term or year. Faculty without such support did a “fairly large overhaul.” And while faculty with instructional designers or more experience with OWI knew that it does not work well to move face-to-face curricula straight to online courses, faculty without the guidance of an instructional designer or lots of experience teaching writing online did not know that. During Q&A, presenters admitted that faculty often had power struggles with their instructional designers: “Ideologically, we came from two different planets….We had been teaching online for years and we had just been doing things our way.” Ultimately, though, they declared that the instruction designer “was, in the end, right.” Presenters also said that the biggest challenge in OWI is maintaining student engagement. They emphasized that OWI “is a different way of teaching” and that while faculty development is a costly endeavor that institutions are hesitant to provide, it works. In getting attendees out of their seats and changing the shape of the presentation space, Goldenthal, Matthews, and Messier invited them to join the call for a performative CCCC 2019 and to be a part of their performance. Session C.09 made it clear that writing instruction is indeed different online than it is in person, and the investments an institution can make to its faculty pay off. This panel’s underlying theme was one of labor, of cost, and of benefit. When the presenters’ institution did not provide costly support to faculty, the faculty required more time and support—more cost—in later terms to make up for the prior lack. When the institution made the investment on initial course developments, that investment returned time that faculty had freed up for other work. The presenters have made the presentation files and links available online. Brian Urias is a PhD student at Bowling Green State University whose research interests include online writing instruction, writing program administration, and writing transfer.